Supreme Ladies Motorcycle Club is a small organization consisting of professional women sharing an interest in recreational motorcycling. In addition to taking recreational rides, the organization is dedicated to providing community service. The organization will conduct the following activities in which all members will participate. Welcome to Day of Dance 2007! 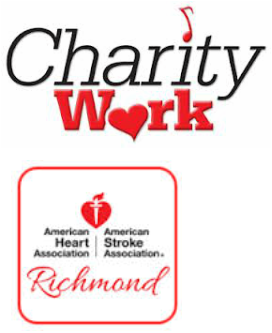 In its third year in central Virginia, Richmond's Day of Dance for Cardio-vascular Health celebrates dance as terrific exercise and a lot of fun--something anyone can do. This high-energy event, presented by Bon Secours for Women, includes free heart health screenings, great dance groups, e-Disco, health education for everyone, heart-healthy food, and great gifts and prizes all day long. There is no charge for admission or for any of the events. Day of Dance is a national program of Spirit of Women, held annually in over 60 cities nationwide to celebrate dance as a great way to exercise and enjoy life. In Virginia, Bon Secours Richmond Health System and Bon Secours Hampton Roads present Day of Dance every year. The Richmond Bon Secours event is the largest in the nation, with thousands of women dancing every year. Angel Food Ministries is a non-profit, non-denominational organization dedicated to providing grocery relief and financial support to communities throughout the United States. The program began in 1994 with 34 families in Monroe, Georgia (between Atlanta and Athens), and has grown to serve hundreds of thousands of families every month across 35 states. Angel Food Ministries crosses denominational lines and has spread the good news of the gospel of Christ through salvation tracts that are placed in each food order. The Central Virginia FoodBank (CVFB) was founded in 1980 to procure and distribute food efficiently and effectively to feeding programs throughout the area. Since then, the Central Virginia FoodBank service area has grown to include 31 counties and five cities in the Central Virginia region. Presently, we distribute food through a network of more than 500 network partner agencies, which includes more than 130 child care providers serving needy children. In addition, we serve as many as 4,000 daily meals in the summer and 2,000 daily meals during the school year to needy children through our 42 Kids Café and 13 Café for Kids programs. The amount of food we distribute has steadily grown over the years. In fiscal year 2005-2006, we distributed more than 12.9 million pounds of food to the hungry. We received donated food from food manufacturers and grocers, the USDA, community and company food drives, and from individual donations of food and money. In fiscal year 2005-2006, food drives provided more than 1 million pounds of food. Children's Miracle Network is the alliance of premier children's hospitals. Every year, Children's Miracle Network hospitals treat 17 million children for every disease and injury imaginable. Children's Miracle Network hospitals impact the lives of more children than any other children's organization in the world. Children's hospitals provide state-of-the-art care, life-saving research and preventative education for children 24 hours a day, 365 days a year. There is a Children's Miracle Network hospital dedicated to serving children in every community across the United States and Canada. These hospitals are committed to providing the best care for children when they need it. ChildSavers is Memorial Child Guidance Clinic. We are a source of hope for Central Virginia’s children. Founded in 1924, the Clinic's legacy of innovation, leadership and care for children has endeared it to three generations of Richmond citizens. Early in its history, MCGC turned exclusively to addressing the mental health and developmental needs of children. At the core of Memorial Child Guidance Clinic's mission is a fundamental commitment to the mental well being of children and the positive bond between adult and child. We support this with adult education and training and clinical treatment services that offer reassurance, healing, and the knowledge necessary to achieve normal life and development. We are a community-supported nonprofit agency. The Clinic is governed by a volunteer Board of Directors and is a COA-certified facility. MCGC is licensed by the State of Virginia Department of Mental Health, Mental Retardation and Substance Abuse Services, and is accredited by the Council on Accreditation for Child and Family Services. The City of Richmond’s Clean Street Commission sponsors a project where local citizens help clean the city’s streets. Richmond SLMC Mother Chapter will adopt a three-block area on Belvidere between Broad Street and Franklin Street. Once a month, members will maintain their adopted area by picking up trash and debris and disposing of it. A sign in the adopted are denotes the organization’s participation in the project. Jennifer Brizel Wood, the founder and director of DSFA, has been involved with the education of children with autism for over eight years. The mission and educational philosophy of DSFA is to provide children with autism an individualized educational program in a loving and supportive atmosphere. DSFA assesses the strengths and deficits of each child to create individualized programs for every student. Student to staff ratio is based on each individual student’s educational and behavioral support needs. DSFA will ensure that each teacher and assistant will be fully trained in an ABA programmatic philosophy. DSFA will provide year round services, weekly community-based activities, tri-monthly home consultations, and opportunities to interact with typical peers. Welcome to The Faison School – Autism Center of Virginia (ACV), a nonprofit autism center dedicated to providing resources for children with autism spectrum disorders (ASDs) and their families. The Faison School – ACV represents a unique private/public partnership between a nonprofit school and a major research center, Virginia Commonwealth University. Through our three-pronged approach of evidence based treatment, research, and community education, The Faison School – ACV serves as a learning center where the most effective autism therapies are used, taught, and shared. The center is located in Richmond, Virginia. The National MS Society is a collective of passionate individuals who want to do something about MS now—to move together toward a world free of multiple sclerosis. MS stops people from moving. We exist to make sure it doesn't. We help each person address the challenges of living with MS through our 50-state network of chapters. The Society helps people affected by MS by funding cutting-edge research, driving change through advocacy, facilitating professional education, and providing programs and services that help people with MS and their families move their lives forward. We are moving research forward by relentlessly pursuing prevention, treatment and cure. We are moving to reach out and respond to individuals, families and communities living with multiple sclerosis. We are moving politicians and legislation to champion the needs of people with MS through activism, advocacy and influence. We are moving to mobilize the millions of people who want to do something about MS now. NAMI is the National Alliance on Mental Illness, the nation’s largest grassroots mental health organization dedicated to building better lives for the millions of Americans affected by mental illness. NAMI advocates for access to services, treatment, supports and research and is steadfast in its commitment to raise awareness and build a community for hope for all of those in need. NAMI Affiliates and volunteer leaders who work in local communities across the country to raise awareness and provide essential and free education, advocacy and support group programs. Richmond SLMC Mother Chapter sponsors Team Orion in stomping out mental illness by raising funds and handing out awareness literature within the community. Also, they begin the NAMI walk by opening the walk with a full motorcycle procession. At Nubian Village Academy, our vision is to be the leaders in a movement designed to provide educational experiences for urban students which inspires students to do more dreaming, thinking, creating and producing while recognizing the integrative importance and value of knowledge, the world, community, family and self. The Leukemia & Lymphoma Society is the world's largest voluntary health organization dedicated to funding blood cancer research, education and patient services. The Society's mission is to cure leukemia, lymphoma, Hodgkin's disease and myeloma, and to improve the quality of life of patients and their families. Since its founding in 1949, the Society has provided more than $425 million for research specifically targeting blood cancers. YMCA Bright Beginnings gives children in our community the tools they need to succeed each school year. We provide students from low-income families with new clothes, shoes and a backpack filled with supplies. Together, we can ensure that hundreds of students get the school year started on the right foot. Richmond SLMC Mother Chapter volunteers with the YMCA to assist children in shopping and to utilize the funds donated appropriately.